Total S.A. (French pronunciation: ​[tɔtal]; English: /toʊˈtæl/ or /toʊˈtɑːl/) is a French multinational integrated oil and gas company founded in 1924 and one of the seven "Supermajor" oil companies in the world. Its businesses cover the entire oil and gas chain, from crude oil and natural gas exploration and production to power generation, transportation, refining, petroleum product marketing, and international crude oil and product trading. Total is also a large scale chemicals manufacturer. Total has its head office in the Tour Total in La Défense district in Courbevoie, west of Paris. The company is a component of the Euro Stoxx 50 stock market index. 2.2 Subsidiaries and affiliates of Total S.A. The company was founded after World War I, when then French President Raymond Poincaré rejected the idea of forming a partnership with Royal Dutch Shell in favour of creating an entirely French oil company. At Poincaré's behest, Col. Ernest Mercier with the support of ninety banks and companies founded Total on 28 March 1924, as the Compagnie française des pétroles (CFP), literally the "French Petroleum Company". Petroleum was seen as vital in the case of a new war with Germany. As per the agreement reached during the San Remo conference of 1920, the French state received the 25% share held by Deutsche Bank in the Turkish Petroleum Company (TPC) as part of the compensation for war damages caused by Germany during World War I. The French government's stake in TPC was transferred to CFP, and the Red Line agreement in 1928 rearranged the shareholding of CFP in TPC (later renamed the Iraq Petroleum Company in 1929) to 23.75%. The company from the start was regarded as a private sector company in view of its listing on the Paris Stock Exchange in 1929. The company during the 1930s was engaged in exploration and production, primarily from the Middle East. Its first refinery began operating in Normandy in 1933. After World War II, CFP engaged in oil exploration in Venezuela, Canada, and Africa while pursuing energy sources within France. Exploration in Algeria, then a French colony, began in 1946, with Algeria becoming a leading source of oil in the 1950s. In 1954, CFP introduced its downstream product – Total brand of gasoline in the African continent and Europe. In 1980, Total Petroleum (North America) Ltd., a company controlled 50% by CFP, bought the American refining and marketing assets of Vickers Petroleum as part of a sell-off by Esmark of its energy holdings. This purchase gave Total refining capacity, transportation, and a network of 350 service stations in 20 states. The company renamed itself Total CFP in 1985, to build on the popularity of its gasoline brand. Later in 1991, the name was changed to Total, when it became a public company listed on the New York Stock Exchange. The French government, who used to control more than 30 percent of the company's stock in 1991, reduced its stake in the firm to less than 1 percent by 1996. In the time period between 1990 and 1994, foreign ownership of the firm increased from 23 per cent to 44 per cent. Meanwhile, Total continued to expand its retail presence in North America under several brand names. In 1989, Denver, Colorado, based Total Petroleum, Total CFP's North American unit, purchased 125 Road Runner retail locations from Texarkana, Texas-based Truman Arnold Companies. By 1993, Total Petroleum was operating 2,600 retail stores under the Vickers, Apco, Road Runner, and Total brands. That year, the company began remodeling and rebranding all of its North American gasoline and convenience stores to use the Total name. Only four years later, Total sold its North American refining and retail operations to Ultramar Diamond Shamrock for $400 million in stock and $414 million in assumed debt. After Total's takeover of Petrofina of Belgium in 1999, it became known as Total Fina. Afterwards it also acquired Elf Aquitaine. First named TotalFinaElf after the merger in 2000, it was later renamed back to Total on 6 May 2003. During that rebranding, the current globe logo was unveiled. In 2003, Total signed for a 30% stake in the gas exploration venture in the Kingdom of Saudi Arabia (KSA) – South Rub' al-Khali joint venture along with Royal Dutch Shell and Saudi Aramco. The stake was later bought out by its partners. In May 2006, Saudi Aramco and TOTAL signed a MOU to develop the Jubail Refinery and Petrochemical project in Saudi Arabia which targeted 400,000 barrels per day (bpd). On 21 September 2008, the two companies officially established a joint venture called SAUDI ARAMCO TOTAL Refining and Petrochemical Company (SATORP)- in which a 62.5% stake was held by Saudi Aramco and the balance 37.5% held by TOTAL. During the 2009-2010 Iraqi oil services contracts tender, a consortium led by CNPC (37.5%), which also included TOTAL (18.75%) and Petronas (18.75%) was awarded a production contract for the "Halfaya field" in the south of Iraq, which contains an estimated 4.1 billion barrels (650,000,000 m3) of oil. As of 2010, Total had over 96,000 employees and operated in more than 130 countries. In September 2010, Total announced plans to pull out of the forecourt market in the United Kingdom. In November 2012, Total announced it was selling its 20% stake and operating mandate in its Nigerian offshore project to a unit of China Petrochemical Corp for $2.5 billion. In 2013, Total started the operation at Kashagan with North Caspian Operating Company. It is the biggest discovery of oil reserves since 1968. In 2013, Total increased its stake in Novatek to 16.96%. In September 2013, Total and its joint venture partner agreed to buy Chevron Corporation’s retail distribution business in Pakistan for an undisclosed amount. In January 2014, Total became the first major oil and gas firm to acquire exploration rights for shale gas in the UK after it bought a 40 percent interest in two licences in the Gainsborough Trough area of northern England for $48 million. In July 2014, the company disclosed it was in exclusive talks to sell its LPG distribution business in France to Pennsylvania-based UGI Corporation for €450 million ($615 million). On 20 October 2014, at 23:57 MST a Dassault Falcon 50 business jet heading to Paris caught fire and exploded during takeoff after colliding with a snow removal vehicle in Vnukovo International Airport, and killing four, including three crew members and CEO of Total S.A. Christophe de Margerie on board. Alcohol presence was confirmed in the blood of the driver of the vehicle on the ground. Patrick Pouyanne, who was Total's Refining Chief at that time, was appointed as CEO,  and also as chairman of Total on December 16, 2015. In February 2015, Total unveiled plans to cut 180 jobs in the United Kingdom, reduce refinery capacity and slow spending on North Sea fields after it fell to a $5.7bn final-quarter loss. The company said it would also sell off $5bn worth of assets worldwide and cut exploration costs by 30%. In June 2016, Total signed a $224M deal to buy Lampiris, the third largest Belgian supplier of gas and renewable energy to expand its gas and power distribution activities. In July 2016, Total agreed to buy French battery maker Saft Groupe SA in a $1.1bn deal, to boost its development in renewable energy and electricity businesses. By October 2016 the company had a share value of 111,581 million euros, distributed in 2,528,459,212 shares. The shares were owned by a large number of shareholders, the biggest being Blackrock (5.02%), the employees of Total SA (4.9%), the company itself (4,7%) and the Group Bruxelles Lambert (2,5%). In 2016 Total agreed to acquire $2.2-billion in upstream and downstream assets from Petrobras as part of the firms’ strategic alliance announced in October 2016. For Total, these new partnerships with Petrobras reinforce Total's position in Brazil through access to new fields in the Santos Basin while entering the gas value chain. Between 2013 and 2017 Total organized the ARGOS Challenge, a robotic competition with the aim to develop robots for their oil and gas production sites. It was won by an Austrian-German team using a variant of the taurob tracker robot. In July 2017, Total signed a deal for a total amount of $4.8b with Iran for the development and production of South Pars, the world's largest gas field. In August 2017, Total announced the acquisition of Maersk Oil for $7.45 billion in a share and debt transaction. This deal will position Total as the second operator in the North Sea. In September 2017, Total signed an agreement with EREN Renewable energy to acquire an interest of 23% in EREN RE for an amount of €237.5 million. In November 2017, Total announced the launch on the French residential market of Total Spring a natural gas and green power offering that is 10% cheaper than regulated tariffs. Total is thus pursuing its strategy of downstream integration in the gas and power value chain in Europe. In 2016 Total also created two new corporate divisions: namely People & Social Responsibility (Human Resources; Health, Safety & Environment; the Security Division; and a new Civil Society Engagement Division) and Strategy & Innovation (Strategy & Climate Division, responsible for ensuring that strategy incorporates the 2 °C global warming scenario, Public Affairs, Audit, Research & Development, the Chief Digital Officer and the Senior Vice President Technology). Subsidiaries and affiliates of Total S.A.
As of 31 December 2014[update], Total S.A. had 903 subsidiaries consolidated into the group results, together with affiliate investments and joint ventures, mostly in LPG. In addition Total had other equity holdings amounting to about 3bn euros, treated as investments and was involved in a number of significant joint ventures, mostly relating to LPG and LNG exploration, production and shipping. The joint ventures which are treated as subsidiaries are listed in the consolidated subsidiary section. A total filling station in Wetherby, West Yorkshire. The company has its head office in the Tour Total in the La Défense district in Courbevoie, France, near Paris. The building was originally constructed between 1983 and 1985 for Elf Aquitaine; Total SA acquired the building after its merger with Elf in 2000. Christophe de Margerie was chief executive from 14 February 2007 until 20 October 2014, when he died in a plane crash at Vnukovo Airport in Moscow. During the plane's takeoff roll it collided with a snowplow which had failed to follow the remainder of its convoy. His total annual compensation for this role was €2,746,335, consisting of a €1,250,000 salary and €1,496,335 bonus. The present[when?] chairman and CEO of the company is Patrick Pouyanné (2014 to present). On December 16, 2015, Patricia Barbizet was named Lead Independent Director. For group functions, the senior vice presidents in charge of: corporate communications, legal, hse, and strategy & climate. For exploration and production, the senior vice presidents in charge of the following business units: Africa, Americas, Asia Pacific, Europe and Central Asia, Middle East / North Africa, Exploration, and one function, decided by the Comex. For refining and chemicals, the senior vice presidents in charge of the following business units: Refining and Base Chemicals Europe, Refining and Petrochemicals Orient, Polymers, Hutchinson, and one function, decided by the Comex. For trading shipping, the senior vice president trading shipping. For marketing and services, the senior vice presidents in charge of the following business units: Europe, Africa, Global Businesses, and one function, decided by the Comex. For Total global services, the president Total global services. Patrick Pouyanné, chairman and CEO. Arnaud Breuillac, president of Exploration & Production. Momar Nguer, president Marketing & Services. In May 2014, the company shelved its Joslyn North oil sands project in the Athabasca region of Alberta, Canada indefinitely, citing concerns about operating costs. An estimated $11 billion has been spent on the project, in which Total is the largest shareholder with 38.5%. Suncor Energy holds 36.75%, Occidental Petroleum owns 15% and Japan's Inpex has a 10% interest. Total is involved in 23 projects of exploration and production in Africa, Asia, Europe, North America, South America and Russia. Total has been a significant investor in the Iranian energy sector since 1990. In July 2017, Total and the National Iranian Oil Company (NIOC) signed a contract for the development and production of South Pars, the world's largest gas field. The project will have a production capacity of 2 billion cubic feet per day. The produced gas will supply the Iranian domestic market starting in 2021. On 29 April 2011, Total agreed to buy 60% of photovoltaics company SunPower for US$1.38 billion. By the 2013 annual reporting date Total owned 64.65%. In May 2016, Total agreed to purchase French battery maker Saft Groupe S.A. for 1.1 billion euros. In June 2016, Total signed a $224M deal to buy Lampiris, the third-largest Belgian supplier of gas and renewable energy to expand its gas and power distribution activities. In December 2016, Total acquired about 23% of Tellurian for an amount of 207 million dollars, to develop an integrated gas project. In August 2017, Total announced they would buy Maersk Oil from A.P. Moller-Maersk in a deal expected to close in the first quarter of 2018. In April 2018, Total announced they were buying 74% of the French electricity and gas provider Direct Énergie from their main stockholders, for 1.4 billion euros. In 1998, the Total SA company was fined €375,000 for an oil spill that stretched 400 kilometers from La Rochelle to the western tip of Brittany. The company was only fined that amount because they were only partially liable because Total SA did not own the ship. The plaintiffs had sought more than $1.5 billion in damages. More than 100 groups and local governments joined in the suit. The Total company was fined just over $298,000. The majority of the money will go to the French government, several environmental groups, and various regional governments. The Total SA company was also fined $550,000 for the amount of marine pollution that came from it. After the oil spill they tried to restore their image and have opened a sea turtle conservation project in Masirah in recent years. Prior to the verdict in which Total was found guilty one of the counterparts in the incident, Malta Maritime Authority (MMA), was not to be tried for having any hand in the incident. In 2005, Total submitted a report to the Paris courts which stated that Total had gathered a group of experts which stated the tanker was corroded and that Total was responsible for it. The courts sought a second expert reviewing this information, which was turned down. In 2001, the AZF chemical plant exploded in Toulouse, France, while belonging to the Grande Paroisse branch of Total. On 16 January 2008, Total was required to compensate all of the victims of the pollution caused by the sinking of the ship Erika in the amount of €192 million. This is in addition to the €200 million that Total spent to help clean up the spill. The company appealed against the verdict, lost the case in the following two appeals and was definitely condemned. In 2016, Total was ranked as the second best of 92 oil, gas, and mining companies on indigenous rights in the Arctic. In May 2016, Total said it would still principally be an oil and gas company but aims to be 20% low-carbon by 2035. In May 2016, Total published their first Climate Report to detail its action as a company and with its partners to meet the growing demand for energy while limiting its impact on the climate. Total's climate strategy is based on three pillars: improving the carbon intensity of its energy mix, its energy efficiency and developing renewable energies. Total is a member of the Oil and Gas Climate Initiative (OGCI), a CEO-led initiative made up of ten oil and gas companies who collaborate on action to reduce greenhouse gas emissions. In November 2016, the OGCI announced to launch a 1 billion dollar climate investment fund to invest in cutting the climate change impact of fossil fuels. The fund will support start-ups and help develop and demonstrate innovative technologies that have the potential to reduce greenhouse gas emissions significantly and also focus on ways to reduce costs of carbon capture and storage technology. Total SA has been involved in multiple controversies. Hereafter there is a list of the main ones. Total is being implicated in a bribe commission scandal which is currently[when?] emerging in Malta. It has emerged that Total had told Maltese agents that it would not be interested in doing business with them unless their team included George Farrugia, who is under investigation in the procurement scandal. George Farrugia has recently been given a presidential pardon in exchange of information about this scandal. Enemalta, Malta's energy supplier, swiftly barred Total and its agents, Trafigura from bidding and tenders. An investigation is currently underway and three people have been arraigned. Despite the European Union's sanctions against the military dictatorship Myanmar, Total is able to operate the Yadana natural gas pipeline from Burma to Thailand. Total is currently the subject of a lawsuit in French and Belgian courts for the condoning and use of the country's civilian slavery to construct the pipeline. The documentary 'Total Denial' shows the background of this project. [unreliable source?] The NGO Burma Campaign UK is currently[when?] campaigning against this project. On 16 December 2008, the managing director of the Italian division of Total, Lionel Levha, and ten other executives were arrested by the public Prosecutor's office of Potenza, Italy, for a corruption charge of €15 million to undertake the oilfield in Basilicata on contract. Also arrested was the local deputy of Partito Democratico Salvatore Margiotta and an Italian entrepreneur. In April 2010, Total was accused of bribing Iraqi officials during former president Saddam Hussein's regime to secure oil supplies. A United Nations report later revealed that Iraqi officials had received bribes from oil companies to secure contracts worth over $10bn. On 26 February 2016, the Paris Court of Appeals considered Total guilty and ordered the company to pay a fine of €750,000 for corrupting Iraqi civil servants. The court's ruling overturns an earlier acquittal in the case. In 2013, a case was settled that concerned charges that Total bribed an Iranian official with $60 million, which they documented as a "consulting charge," and which unfairly gave them access to Iran's Sirri A and Sirri E oil and gas fields. The bribery gave them a competitive advantage, earning them an estimated $150 million in profits. The Securities Exchange Commission and the Department of Justice settled the charges, expecting Total to pay $398 million. In October 2001, Total signed a contract for oil-reconnaissance in areas offshore Western Sahara (near Dakhla), with the "Moroccan Office National de Recherches et d’Exploitations Petrolières" (ONAREP). In January 2002, Hans Corell (the United Nations Under-Secretary-General for Legal Affairs) stated in a letter to the president of the Security Council that whenever the contracts are only for exploration they're not illegal, but if further exploration or exploitation are against the interests and wishes of the people of Western Sahara, they would be in violation of the principles of international law. Finally, Total decided to not renew their license off Western Sahara. Total is an official recommended fuel and lubricants for Nissan, Infiniti, Datsun, Renault, Dacia, Kia Motors, Citröen, Peugeot, Honda, Acura, Aston Martin, DS, Mazda (shared with Castrol), Sany and Tata Motors for automobiles only as well as Peugeot Motocycles, Kawasaki (fuel only) and Honda for motorcycles only. Total has provided fuel and lubricants to professional auto racing teams. Total has been a longtime partner of Citroën Sport in the World Rally Championship, Dakar Rally and World Touring Car Championship. 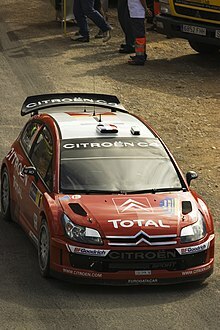 Sébastien Loeb won nine WRC drivers titles, whereas Ari Vatanen and Pierre Lartigue won four editions of the Dakar Rally. Total has been a partner of Peugeot Sport in Formula One from 1995 to 2000, the British Touring Car Championship in 1995 and 1996 and since 2001 in the World Rally Championship, Intercontinental Rally Challenge, 24 Hours of Le Mans, Intercontinental Le Mans Cup, Dakar Rally and Pikes Peak International Hill Climb. Total was a partner of Renault Sport in Formula One from 2009 to 2016. Their logo appeared on the Red Bull Racing cars since 2009, the Renault F1 cars in 2009, 2010 and 2016, and the Lotus F1 cars from 2011 to 2014. Total also partnered Caterham F1 Team in 2011-2014, Scuderia Toro Rosso in 2014-2015 and Williams F1 Team in 2012-2013. Also, Total was the title sponsor of the Copa Sudamericana football tournament in 2013 and 2014. In April 2017, Total S.A. was appointed by FIA and ACO as official fuel supplier of World Endurance Championship and 24 Hours of Le Mans from 2018-19 season onwards. Total is one of the official sponsors for one of the most popular and influential Mexican soccer teams, Club America. In terms of educational development Total provides scholarships worth millions of euros annually to international students to study in France. These programs are mainly for master's degree. Doctoral scholarships are also offered but in limited numbers. The student come from mainly from Europe, Africa, Asia and the Middle-East where Total Operates. Students from Africa are mainly from Nigeria. The scholarship involves the payment of Tuition and a monthly allowance of 1400 Euros (2014 disbursement). The allowance is able to cater for feeding, transportation and accommodation for the students. The drop in oil prices in 2015 has led to the reduction of the number of scholars. The scholarship scheme has come under a lot of criticism for various reasons. Some scholars believe the flat rate of 1400 euros is unfair as the cost of living for cities in France are not the same. Also, students have complained that the monthly allowance needs to be reviewed and upgraded to 2000 euros monthly. Other criticism include the fact that the number of PHd. scholarship slots are very small compared to the master's degree slots. In July 2016, Total has secured an eight-year sponsorship package from the Confederation of African Football (CAF) to support 10 of its principal competitions. Total will start with the Africa Cup of Nations to be held in Gabon therefore renaming it Total Africa cup of Nations. ^ a b "Annual Report 2017" (PDF). Total. ^ "Euro Stoxx 50 | Index | 965814 | EU0009658145 | Börse Frankfurt (Frankfurt Stock Exchange)". Boerse-frankfurt.de. Retrieved 4 November 2015. ^ "MILESTONES: 1921–1936, the 1928 Red Line Agreement". US Department of State. Archived from the original on 29 July 2012. Retrieved 18 August 2012. ^ "An Administrative/Biographical History of Iraq Petroleum Company". Retrieved 18 August 2012. ^ a b c "Total company info on Britannica". Retrieved 18 June 2012. ^ Atlas, Terry (27 August 1980). "Esmark will sell TransOcean oil, gas unit to Mobil". Chicago Tribune. pp. 4–3. Retrieved 23 September 2015. ^ Cole, Robert J. (22 August 1980). "Mobil high bidder for Esmark oil holdings". Lawrence (KS) Journal-World. New York Times News Service. p. 24. Retrieved 23 September 2015. ^ "Jack Vickers". Colorado Business Hall of Fame. 2009. Retrieved 23 September 2015. ^ "Chapter 2". Eia.doe.gov. Archived from the original on 15 June 2010. Retrieved 8 December 2011. ^ "About Road Runner". Road Runner Stores. Archived from the original on 16 May 2015. Retrieved 23 September 2015. ^ "Total Petroleum to rebrand and restructure its stores throughout the Midwest". PR Newswire. 14 January 1993. Retrieved 23 September 2015. ^ Salpukas, Algis (16 April 1997). "Ultramar Diamond Shamrock Is to Acquire a Unit of Total". New York Times. Retrieved 23 September 2015. ^ Spaeth, Tony. "Review of Total logo". Identityworks. Archived from the original on 3 May 2012. Retrieved 4 May 2012. ^ "Shell and Total sign natural gas agreement - South Rub Al-Khali - Gas Processing". Gulfoilandgas.com. Retrieved 4 November 2015. ^ "SAUDI ARAMCO TOTAL Refining and Petrochemical Company (SATORP) completes US$8.5 Billion project financing for Jubail Refinery". Retrieved 18 August 2012. ^ "History of SAUDI ARAMCO TOTAL Refining and Petrochemical Company (SATORP)". Archived from the original on 27 August 2012. Retrieved 18 August 2012. ^ "Shell walks away with Majnoon". upstreamonline.com. 11 December 2009. ^ "Halfaya trio sign on dotted line". upstreamonline.com. 27 January 2011. Retrieved 22 August 2012. ^ "Total.com – Businesses of the Total Group". Retrieved 9 July 2010. ^ "Total to sell 500 UK petrol stations". independent.co.uk. 10 September 2010. Retrieved 18 August 2016. ^ "Total Sells Stake in Nigerian Project to Sinopec for $2.5 Billion". Wall Street Journal. United States. 2012. ^ "Global Experience of Total – key to success in Kazakhstan". Investkz.com. Retrieved 4 November 2015. ^ "Total deal speeds up UK shale gas race". International: Reuters. 2014. ^ "Total to sell LPG distribution business in France to UGI Corp unit for 450mn euros". Pennsylvania Sun. Retrieved 3 July 2014. ^ "CEO of French oil giant Total dies in jet crash at Moscow's Vnukovo Airport — RT News". Rt.com. Retrieved 4 November 2015. ^ "Total appoints Patrick Pouyanne as CEO after Christophe de Margerie dies in plane crash". Finance: Daily Telegraph. 2014. ^ Terry Macalister. "Total to cut 180 UK jobs after $5.7bn loss | Business". The Guardian. Retrieved 4 November 2015. ^ "Total Acquires Lampiris to Expand Its Gas and Power Distribution Activities". www.businesswire.com. Retrieved 20 December 2016. ^ "Total to Buy Battery Maker Saft in Push to Expand Clean Energy". Bloomberg.com. 9 May 2016. Retrieved 20 December 2016. ^ "Total to buy $2.2 billion in Petrobras upstream, downstream assets". www.ogj.com. Retrieved 1 March 2017. ^ "Argos Challenge Website". ARGOS Challenge. Retrieved 13 May 2017. ^ "THE ARGONAUTS ROBOT WINS THE ARGOS CHALLENGE!". Total Group Website. Retrieved 13 May 2017. ^ a b Reed, Stanley (3 July 2017). "Total Signs Deal With Iran, Exposing It to Big Risks and Rewards". The New York Times. ISSN 0362-4331. Retrieved 4 July 2017. ^ www.maersk.com, Mærsk -. "Total S.A. to acquire Mærsk Olie og Gas A/S for USD 7.45bn and make Denmark a regional hub". www.maersk.com. Archived from the original on 24 August 2017. Retrieved 29 August 2017. ^ "Total buys 23% stake in renewable energy company Eren". Financial Times. 19 September 2017. Retrieved 20 September 2017. ^ Editorial, Reuters. "Total ready for price war as it enters French retail power market". U.S. Retrieved 25 March 2018. ^ a b "Total Presents New Organization to Achieve Its Ambition of Becoming the Responsible Energy Major". BusinessWire.com. 19 April 2016. ^ "Exploration-Production". Exploration-Production (in French). Retrieved 4 June 2018. ^ "Total: Main indicators". Reuters. 15 October 2009. Archived from the original on 9 September 2012. Retrieved 19 October 2009. ^ a b " "Total: l'héritage de la fusion". fr. Retrieved 8 July 2010. ^ "Christophe de Margerie: Executive Profile & Biography". BusinessWeek. McGraw-Hill. Retrieved 7 September 2009. ^ "Christophe de Margerie Profile". Forbes. Retrieved 7 September 2009. ^ Total. "The Group Performance Committee, Looking at the Big Picture". www.total.com. Retrieved 20 December 2016. ^ l (4 July 2016). "Appointments to the Executive Committee at Total". total.com. Retrieved 4 July 2016. ^ "Projects". Exploration & Production. 6 October 2016. Retrieved 28 February 2017. ^ "GAO-10-515R Iran's Oil, Gas, and Petrochemical Sectors" (PDF). United States Government Accountability Office. 23 March 2010. Retrieved 20 May 2010. ^ Herndon, Andrew; Martin, Christopher; Goossen, Ehren (29 April 2011). "Total Agrees to Buy SunPower for $1.38 Billion in Renewable-Energy Push". Bloomberg. Retrieved 30 April 2011. ^ "Total to Buy Saft to Boost Renewable Energy Business". 9 May 2016. Retrieved 9 May 2016. ^ "Total to buy Belgian green energy provider Lampiris - De Standaard". Reuters. 14 June 2017. Retrieved 20 December 2016. ^ "Total makes $207 million investment in Tellurian to develop integrated gas project". ^ CNBC (21 August 2017). "Maersk agrees to sell oil unit to Total in $7.45 bln deal". Retrieved 21 August 2017. ^ Nabil Wakim (18 April 2018). "Total va acheter Direct Energie et espère bousculer le marché de l'électricité". Le Monde.fr (in French). Retrieved 18 April 2018. ^ "The Malta Financial&Business Times". Businesstoday.com.mt. 23 February 2005. Retrieved 4 November 2015. ^ Surran, SA Editor Carl (24 May 2016). "Total aims to be 20% low-carbon within 20 years, CEO says". Seeking Alpha. Retrieved 20 December 2016. ^ "Bloomberg Briefs". newsletters.briefs.bloomberg.com. Retrieved 20 December 2016. ^ Carrington, Damian (4 November 2016). "Oil firms announce $1bn climate fund to clean up gas". The Guardian. ISSN 0261-3077. Retrieved 20 December 2016. ^ "totaldenialfilm.com". totaldenialfilm.com. Archived from the original on 23 September 2007. Retrieved 8 December 2011. ^ "Tangenti per il petrolio in Basilicata: arrestati l'ad Total e un deputato del Pd". il Giornale (in Italian). 16 December 2008. Retrieved 16 December 2008. ^ "Tangenti, arrrestato l'amministratore delegato di Total Italia" (in Italian). La7. 16 December 2008. Archived from the original on 17 December 2008. Retrieved 16 December 2008. ^ "Total faces corruption investigation". 7 April 2010. Retrieved 8 April 2010. ^ "Total to Pay $398 Million for Corrupt Practices". JD Journal. 30 May 2013. Retrieved 4 November 2015. ^ "Letter dated 29 January 2002 from the Under-Secretary-General for Legal Affairs, the Legal Counsel, addressed to the President of the Security Council" (PDF). UN. 12 February 2002. Archived from the original (PDF) on 7 December 2010. Retrieved 6 September 2010. ^ "Upstream Online: Total turns its back on Dakhla block, 2004". Western Sahara Resource Watch. 3 December 2004. Retrieved 2 September 2010. unreliable? ^ "FIA WEC Secures Five Year Total Deal". sportspromedia.com. sportspromedia.com. 20 April 2017. Retrieved 20 April 2017.